What is it about siblings that makes them want to scare each other? It’s especially bad when two older sibs team up to scare a younger one, as in this tale. Poor Spencer is just minding his own business, happily playing by himself, when his brothers, Leonard and Bertram, start to stir up trouble with talk of Frankenbunny, the worst monster ever. They are so insistent and descriptive that over the course of a day they talk Spencer out of his unbelief in monsters and have him crying to his parents. But the next day, when the big brothers are away, the little brother finds their crumpled-up scheme to scare him and plots his revenge. And oh, is it sweet. Brereton’s seemingly digital illustrations portray a gray-and-white bunny family of diverse body types and sometimes-clichéd personalities: one brother is fat and thuggish, the other is skinny and nerdlike in red glasses; Spencer is a “regular” kid; Mama has pink cheeks and a swoosh of hair, and Papa sports a beard; all have distractingly thick oval eyebrows. 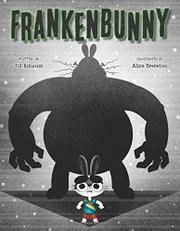 Frankenbunny is seen only in silhouette until Spencer’s payback, and readers will know what’s coming, reducing the scare factor.